How old is my Australian Made Beale Piano? Enter your serial number below to find out. Your Beale Piano was made sometime between 1893 and 1976. We inherrited a Beale piano and wanted to know its age. So after some digging I found a table of serial numbers and year of manufacture. Turns out our Beale is over 100 years old. If you have the serial number, you can use the tool below to find out the age of your Beale. For serial numbers 1? (unsure what the first number was) to 16448 the exact year is unknown. 1884 to 1893 are Habsburg Beales (sometimes spelled as Hapsberg) imported from Germany. 1893 to approx 1902 are non iron tuning system. Approx 1902 the Bader-Vader iron tuning system was introduced. The last Australian made Beale was made in 1976. Enter your serial number above to find out when it was made. Sometimes there is a year written in pencil on the side of one of the piano keys, which may also give you the year of manufacture, or at least the age of the keys. What Does a 100 Year Old Beale Sound Like? Our piano hasn’t been tuned in nearly a year, so while it was at concert pitch, it has eased off a bit. Also please excuse the background noises and static – I recorded this on my phone when my wife was playing one day. As well as regularly tuning your Beale, you can keep it looking amazing too. 1884: Octavius Beale set up a buisness in Sydney to import pianos and sewing machines into Australia. The sewing machines didn’t last long, but he found success importing German upright pianos (of which some still survive) now known as Habsburg Beales. 1893: Beale opened Australia’s first piano factory in Sydney. He made pianos using Australian timbers, built for Australian conditions. The mill department of the factory burned down in a fire in 1901, though thanks to the modular layout of the factory, no other departments were lost. 1893 – 1902: Beale introduced an innovative all-iron tuning system. The patent was granted in 1902, though the exact date it was invented and introduced into manufacturing is unknown, but predates the patenting by some years. Beale was dissatisfied with the timber tuning systems used in European pianos which didn’t hold their tune long enough in Australia’s heat and humidity, so along with Johann Carl Vader – the manager of the Beale factory – he came up with a solution. The all-iron tuning system is effectively a massive iron plate to which the strings are attached. It’s a bit more refined than that though, and is entirely encased inside the piano. Thanks to this iron plate, Beales stay in tune for a long time, but weigh a lot more than other pianos, and require an experienced piano tuner to adjust. It seems that some of the very early iron-tuning system pianos (prior to being patented) simply had “Beale and Co”. Then from about 1902, the early 20th Century Beale pianos had “Beale-Vader Tuning System” embossed in large lettering on it. 1902: Sir Edmund Barton (Australian Prime Minister) opened the new Beale factory at Annandale in Sydney, which became the largest piano factory in the southern hemisphere and the British Empire in the early 1900s. This was a remarkable factory, which manufactured every single component of the entire piano. It had iron and brass foundries, electroplating, machining, as well as all the timber workshops and kilns (for drying timber) and experimental labs. Basically raw materials in, Beale pianos out. The factory could produce up to 3,000 pianos a year (1922 was the record year with 3,000 made). 1943-1945: Beale manufactured parts for the de Havilland Mosquito aircraft during World War 2. The Mosquito was an innovative UK aircraft constructed primarily from timber (unlike the aluminium Spitfires and such), which allowed timber manufacturers (including piano makers) in the UK, USA. Canada and Australia to use their factories for the WW2 war effort. A few Beale pianos were also made in this time. 1976: Last Australian made Beale completed. Serial number 94983. Nearly 100,000 Beale pianos. Not a bad run! Beale was born in Ireland on 23 February 1850 at Mountmellick, Queen’s County. Beale first arrived in Australia in 1854. He was schooled partly in Hobart, then in Ireland. He spent some years in Melbourne, then New Zealand, and returned to Australia and married Elizabeth Baily in Sydney in 1875 and had thirteen children. He established his piano manufacturing business in Sydney, though travelled often. He spent time in London with his family during WW1 while his three sons served in active duty. Outside his business pursuits, Beale had his quirks – pursuing medical conspiracies and population theories (he even paid for a Royal Commission into secret drugs). While his theories and report were sidelined, Beale was however well respected and made a Fellow of the London Royal Historical Society and the Royal Society of Arts. Beale also served as President of the New South Wales Chamber of Manufactures and Chambers of Commerce of the Commonwealth of Australia. He was also appointed as a Trustee of the Australian Museum and and the Bank of New South Wales (which later became Westpac). He also grew orchids and rare plants, and studied Australian timbers extensively. He died in 1930 at eighty years of age in a car accident in New South Wales. 1971 – 1974: Exact year unknown. We became the proud owners of 20788 today! It has been gifted to by daughter by my uncle and belonged originally to her great great grandmother! I’m so glad I found your page and was able to learn something about this piano. I hope you enjoy many wonderful years with your 111 year old piano! Hi Daniel, thanks for the Beale story, shifting 42469 to its new home in Mudgee nsw. 98years young, the little kids love it. Regards Phil. I don’t own a piano, can’t play a piano but really enjoyed reading an important part of Australia’s history; musical and innovation! I am just writing to say you are awesome!!!! You have replied to most of these people with such brilliant insight and information that really opens the doors to the history of their beautiful, very well made instruments and most of them didn’t even take the time to thank you. Well I really enjoyed the effort you have put in here and giving me a part of Australia’s history I had no idea about. Kind of you to say so. Much appreciated. Have a lovely 1911 Parlour Semi Grand. Two small holes in upper rear case panel about 280mm from each side. Inside found several hollowed out walnut shells and some plastic wrapping. This would not have been an original feature although honky tonk sound had nut bouncing beat. Removed these and placed mesh over holes. Thanks for your patience with all enquirers. Never seen that before, that’s just nuts! (Pardon the pun). Walnut keep you any longer. Cashew later. I have an upright piano that says “Hapsburg” and underneath it has “Hugo Wertheim, Melbourne”. I checked the serial number from your instructions and found it inside. It’s numbered “3377”. Maybe you could shed some light on it. Wertheim was a competitor to Beale, based in Melbourne, and followed a similar business plan at around the same time as Beale. Initially Wertheim imported pianos from his homeland of Germany – Hapsberg pianos (Beale also imported Hapsberg pianos), and then in 1908 he opened his own huge piano factory, just as Beale did some years earlier. So your piano is one of the ones Wertheim imported between 1880? and 1908 when he started making his own pianos. I don’t know the serial number ranges for Wertheim pianos, but perhaps we could guess 1890-1899? Which makes your 19th Century piano over 120 years old – a credit to you and the previous owners. I have an upright “Beale – Vader- Steel- Wrest- Plank” (as on steel frame) Serial No: 14548. It has a magnificent coat of arms inside the lid with “By Royal Letters Patent” over the top and “DIEU ET MON DROIT” at the bottom of the coat of arms. “Salon Grand” is printed in gold writing above keys on open key board. It has dual brass candle stick holders either side at the front. It is in immaculate condition, perfectly tuned with beautifully preserved cream ivory’s. It was purchased by my Great Grand parents, from England soon after they immigrated to Australia, and handed on to me from my Grand parents. Would like to know how old it is and what,( if any) do I maybe need to polish it with, to preserve it for the future, even though it still is shinny? Wow, what a beautiful instrument. That serial number, combined with the Beale Vader steel frame, dates it between 1902 and 1905. At a guess, I’d say 1904. So your piano probably turns 115 this year. The coat of arms is British, and yes, the british coat of arms has French at the bottom of it – it means “God and my right”, and was coined when British kings spoke French. Hope this helps, and you get to enjoy your magnificent piano for many years to come. Thank you so much Daniel for your reply & information. Its great to know how to safely preserve the woodwork… and from someone who worked in the Beale factory as a French polisher!! Many thanks for contacting Robert Menhenick for me & for your input, Robert. The ‘old lady’ is doing very well for being 115 years young and I’m sure will continue to assist many little pianists in our family as she is lovingly passed down to future generations. Thanks again for your wonderful website & your knowledge you share with us all, it is much appreciated. I was an apprentice French polisher in the early 50s at Beales & spent 8 happy years there. That’s amazing Robert! To think that there are hundreds of treasured pianos used by families across the country that you helped make. Thank you sir! Any tips or advice for Beale owners? Since I am becoming an antiquity,I have to sell our Beale pianola with some 200 rolls of all sorts . From Lilac time up to Nat king Cole and Jerusalem. It is well looked after and plays as good as your joints might bring up.It has been regularly tuned and since I am here at Bali, surely protected against corrosion and creepy crawlies. I’m thinking around a thousand Euro. Very excited to learn that the 110 year-old Beale-Vader piano 19133 (ca. 1908) which has just been passed down to the 5th generation of the same family tree is so special! Just wondering what year and why such a different serial number? The really early Hapsberg Beales were imported from Germany and while the exact year for each serial number is unknown, it is between 1884 to 1893. Given how low the number is, I’d take a stab in the dark and say 1885 or 1886. So that’s quite an old and rare piano there. Amazing to think an instrument about 133 years old is still going. Nice. I am looking into one of Beale pianos to purchase off my neighbour and she has provided me UP108M this number. It does not look like a serial number and not sure what it represents? Could you help me with this particular number? many thanks in advance. The Beale serial number will be 5 digits long. It will be stamped into the timber at the top right of the piano visible when you lift the lid. UP108M is not the serial number. Even if it is a misreading of numbers into letters (U could be 8 or 0, P could be 8, and the M possibly a 4), it’s 6 digits. Sorry. I’d ask for a look. I’ve just added a photo to the article showing the location of the serial number in more detail. Sorry i have another question to ask. I am looking into buying a piano, as you know already, and this lady has a Lisner Piano made by Beale. What does this mean? Is this like a “series” or is this a completely different brand? Also, what’s Beale’s tunes like? I am so used to Samik piano which i had for close to 20 years and didn’t really like it as it’s tune was so heavy and low. Would Beale be similar or very different? Yes, the sound of the older Beales can be a bit heavy. I prefer to think of it as rich and resonant. I have included a recording of our 100 year old Beale in the article. Hi. I just bought a beale serial number 38336 for $200. Would like to restore it. Its not in a bad count. Where can i buy some parts for it please. Our Beale has serial number 73175 or possibly 78175 but its the number 016 just below which puzzles us. Please advise the meaning of the three digits. So the year is either 1948 or 1953. However I really have no idea about the 016 below – I haven’t encountered that before. It doesn’t look like a month / day. Sorry. Hi Daniel, thank you for going to the trouble to share your knowledge. Does it extend to the baby grands. I have just bought an old baby grand Beale for my son! The only numbers i can find are 13186 stamped on to the back of both of the first two keys, and the number OV 20 stamped near where each of the three legs bolts on.on your serial finder it says somewhere between 1883 & 1904. This is probably as close as we will ever get. I note that the wording embossed on plate is just Beale Tuning System, no mention of poor old Vader. I’m guessing that the serial number is correct, and you could possibly narrow it down to 1900 – 1901, as around 1902 Vader made an appearance. My grandmother who just turned 90 has her parents Beale, which now resides in her nursing home in Bayswater, WA. 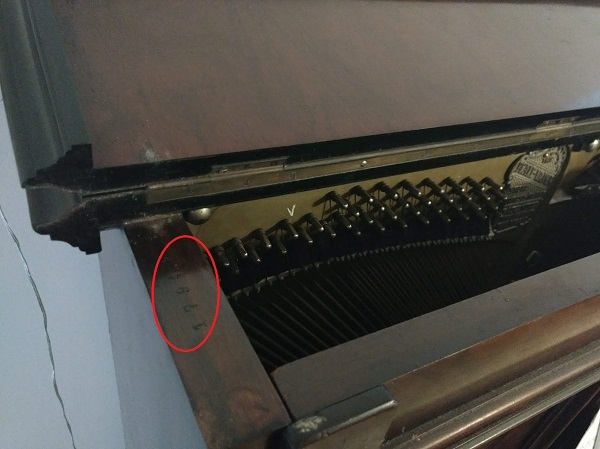 After much searching, I finally located the serial number written in pencil on the top right hand side of the actual back plate of the workings inside the piano. 17968 is still written after all these years. Remarkable. Nanna does have dimentia, but still remembers how to play her hymns on her beloved Beale that she’s had all her life. Wow. That’s wonderful. What joy she must have in her faithful 110 year old piano. Thanks so much for posting that. Hello hoping you can assist me with my inquiry. I have a Beale upright piano with the Beale Vader iron plate stamped on the inside, I’ve located the serial number but I’m missing the second number so I have 1?872. On the right hand side it is stamped concert model , just curious on the age and a little bit about this beautiful piece. Your piano is at least 110 years old. 19872 would have been made in 1908, so the largest serial number (and latest date) would be 1908. Earliest would be about 1902, as I believe that is when they started stamping “Beale Vader” on the iron plate. So you have a magnificent 110-116 years old piano. I don’t know anything specific about concert models, but sounds like a lovely instrument. Thank you soo much for getting back to me, much appreciated. We have a refurbished Beale that we purchased about 25 years ago. Its serial number is 15237 and has the Gold coloured iron frame. Im looking at selling it as its no longer used. It was tuned regulary up until about 10 years ago when it was no longer used. Any idea of the age and approx value.? I think your piano was made between 1901 and 1903. Though the exact years between 1883 and 1904 are unknown, 16449 was the first one made in 1905, and they were making between 300 and 1,000 a year in those days, so 1,200 less could be anywhere from 1900 to 1904, but I’d shave a year either side and say 1901 to 1903. Value? Despite their magnificent age, they were built well enough that there are still a lot of playable Beales out there. They go between $500 and $5,000 on ebay depending on condition. 10 years is a while without any TLC – I’d suggest getting it tuned and any issues identified. Your piano tuner may have a better idea of the selling price. We’ve 1922 Beale. Seems in good condition after all these years in the family. Thoughts on value for sale?? We have a Beale Upright Parlour piani number 22131. Does anyone have an idea of how old it is.It has been in our family for 49 years and played occaisionally. My questions are , with a number of 22132 how old would it be? and for an approximately what would be a fair to sell it for? Thanks Daniel, that makes sense. The piano was new when my parents bought it so therefore it would be rebadged? I’m guessing it makes it lesser quality? Ah, in that case, I have no idea 🙂 Newer may also mean easier to tune. I’d suggest that if you like how it sounds or it has sentimental value, then keep it. It’s wonderful to have a piano in the house, whether you play seriously or just tinker now and then. I’m guessing your parents bought an older Australian made Beale in 1993 and not a new one. You can use the serial number check above to find out the age if it was an Australian made one (1883 – 1976). Any Beales made after 1976 are imported and rebadged. If it is an older Australian made one, then it has the unique iron tuning system, which is both good and bad. Good because it keeps the piano in tune for longer and lasts a long time (my 100 year old Beale is tuned to concert pitch and sounds fantastic). Bad because it is difficult to tune. It is a special skill that surprisingly few piano tuners have. The first guy we tried was terrible – broke strings and so on. There is a good chance your Beale may need new dampening pads, but that it is also a fine a beautiful piano. It’s like mechanics – some will tell you to get a new car, others will instead fix a couple of things and keep it going. I’d go with the latter piano tuner. Every time we have ours tuned there’s a key or two stuck and it needs a new pad or two, so it takes about 2-3 hours to tune and fix our Beale each year (which means it costs a bit more), but it sounds amazing and I just love having a piece of history in our lounge room. 16448 was the last piano made in 1904. Prior to this the years are uncertain, but given yours is between 2/3 and 3/4 of the way to 16448, I’d guess it was about 2/3 to 3/4 quarter of the time from 1883 to 1904, which is about 1897 to 1899? That’s a very rough estimate, assuming equal numbers. In any case, it’s well over 100 years old and a testament to your family for keeping it going. My Beale has a golden coloured iron tuning system, and it’s a nice piano, but I don’t know whether that is any better than any other coloured metal plate. Perhaps the colour reflects when it was made? The iron tuning system is the heart of the Beales, so it is very important. But rather than colour, what I’d look for is whether it has been tuned frequently, and whether the iron pins are rusted or not. Rusted pins may make it very difficult to tune without a complete refurbishment, which will cost thousands. Beales are unique in removing timber from the tuning system, and while they hold their tune for a long time, the lack of timber also makes Beales difficult to tune, especially if the pins have rusted. Having said that, mine is over 100 years old and sat for 8 years without tuning and was brought up to concert pitch in a few hours by a skilled piano tuner. Hope this helps. Maybe someone here can give you an idea of the value, I don’t know. On gumtree you see Beales selling around $500 to $5,000, depending on condition. $5,000 is for a fully refurbished one. Many of the Beales for sale are quite old, like yours. Unfortunately there are so old pianos out there – 100 year old Beales are still quite common – so they don’t fetch premium prices. Hope this is some help. Serial number 30913 was between 1912 and 1916. More precisely? Serial number 27929 was the last one for 1911, and 35000 was the first for 1917. World War 1 put a spanner in the works – less accurate records and production diverted to the war effort. But we can still get a rough estimate. About 2,000 pianos were made per year before the war, but that slowed to only 700 in 1917. Serial number 30913 is nearly 3,000 more than start of 1912, so given an average of 2,000 per year pre war, it was probably not 1912, more likely mid way through 1913. We have a Beale Pianola, however, we cannot find the serial number? the only numbers we found were where the Pianola pedals are situated, they are 2307 & 2308? Sorry, but I don’t know about the pianolas. In general though, the serial number is near the top of the piano – typically under the top cover on the left hand side stamped into the timber. Dollar value? A quick look on gumtree shows a few for sale at the moment ranging in price from $250 to $5,000. 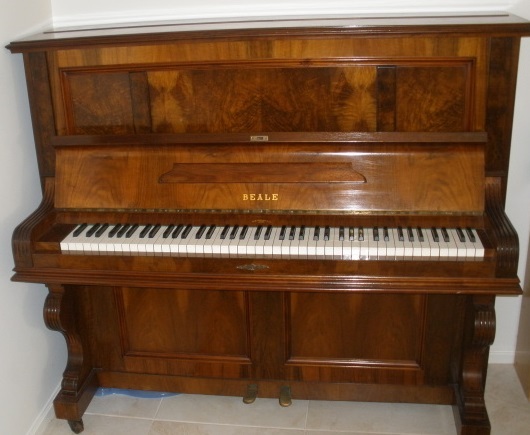 (https://www.gumtree.com.au/s-pianola+beale/k0?sort=rank). That’s a lot of leeway depending on age and condition. That’s an early one! Vader (not Darth) was the guy who helped come up with the iron tuning system, and it was patented by Beale around 1902. Beale didn’t use the Beale-Vader name on the really early ones. When he invented the iron plate is unknown, but it was before 1902. Your serial number is 5,000 before 16448 which is in 1904, so I would say before 1900. It’s not a Habsberg Beale, so post 1893. So you piano was most likely made sometime between 1893 and 1899. Isermann is a guy in Germany who made excellent piano actions that most major piano manufacturers purchased from him (and his son post 1870) in the mid to late 1800s. I suppose it was a bit like “Intel Inside” for pianos. I’m not sure when the Isermann logo appeared on Beales, but I’d guess it was early on (from 1893) before Beale had established his own reputation, and before he started making his own piano actions (which was probably 1902 with his new factory). Hi we have 32043 is this of any significance my grand mother said its one of a special pair made for a exhibition of some sort ? Thanks for asking, but I have no idea what they did in the way of specials. I only have a rough serial number to year list, which dates yours at 1912-1916. Sounds like a lovely 100 year old piano though. Maybe someone else out there knows? Anyone? Daniel, do you know, or do you know someone, some guidance on operating or fault finding a Beale pianola, 1926. The roll rotates but nothing heard. Thanks for asking, but sorry, I don’t have a clue. I hope you find an answer somewhere. The ones I see advertised in Australia (ebay, gumtree, etc) – 100 year old Beales sell for between $500 to $3,000 ($3k for fully refurbished). Piano removers charge something like $300 for a 10km trip, so that needs to be considered by the buyer too. Even though at 109 years old yours is an antique (like mine), there are so many of them out there they are still in common use, thus not very expensive. I have been advised by a piano tuner that the Beale tuning system on older Beales is not viable to be tuned due to the cost of adjusting the tuning arrangement, any comments on this ? Sorry to say, but that tuner just doesn’t know what he is doing. We have an upright grand (large upright) Beale that is over 100 years old, with the massive steel plate. The first tuner guy we tried was terrible – he broke two strings and couldn’t get it in pitch. He hated our piano and gave up – much like the person you spoke to. Then we found another guy who after 8 years of not being tuned had our Beale in concert pitch in about 2 hours (without breaking anything). There’s an art to tuning Beales, so you just need to find someone who knows them. They are the most common make of piano in Australia, so there should be plenty of tuners who can tune a Beale. I can recommend the tuner who sorted our Beale out in the Brisbane area. On the plus side – thanks to the steel plate, once in tune they stay in tune for twice as long (1-2 years). Thanks Daniel ,you’ve given me some hope there.I used the serial number search and it reveals the age at 1909.There is also a handwritten date in pencil on the side of one of the lowest keys, April 1910 , so maybe this was when it was first tuned or sold etc ? Re your comments on the tone,I agree ,we are very fond of this piano . I have a Carl Vader upright which I believe may have been a limited edition Beale. Where would I find the serial number to determine the year of manufacture? On Beales the serial number is on the top edge of the left had side panel – lift the lid and it should be there. It is stamped into the wood without any colour – just pressed in numbers – and not terribly obvious. Johann Carl Vader was the manager of the Beale factory where Beale patented and used the “Beale-Vader” tuning system (a massive steel plate), but I don’t know anything more about pianos that are named after Carl Vader. I think I read somewhere that after 1976 the branding was sold, and applied to imported pianos – so I’m not sure where to go from there. The serial number on post 1976 Beales may be from the overseas manufacturer. Thanks for posting. Sorry I can’t be more help. I would like to know more about my Beale but the only number engraved on it is 67. Seems to be in great condition, I’m also near Brissy so would be keen to know who you had tune yours? I’m not sure what the 67 means. Seems too low a number for a serial number. In regards to the tuner, thanks for asking, I’ve updated the main article with the link for Jack the piano tuner who I recommend.